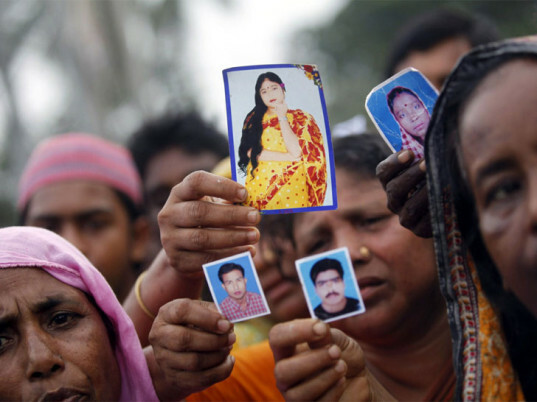 It is now six months since the Rana Plaza factory collapse in Bangladesh, where over 1100 people died, and the garment industry is still scrabbling to pick up the pieces. More than 100 companies have now signed up to an agreement on monitoring factory fire and building safety in Bangladesh, and international efforts are being made to sort out compensation for the workers. But will this mean that all is well with global trade again? Can we all go back to buying cheap clothes without guilt by telling ourselves that low-pay jobs are good for their economy and fast fashion good for ours? Let us go back to six months ago and revisit the scene of the building collapse. 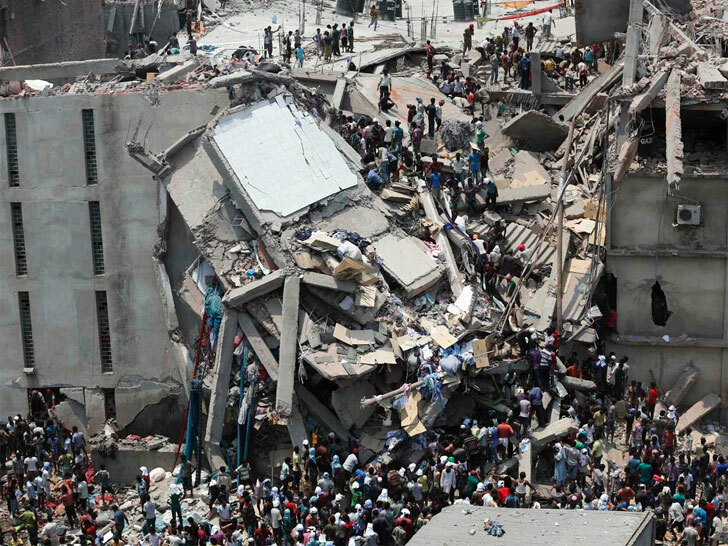 A few days before the collapse a crack appeared in the side of the Rana Plaza building, workers from all the businesses in the eight-story building were sent home while the building was surveyed. The owner of the building was told by experts that there was a serious issue, yet workers from the garment factories were commanded to return to work the next day. This the garment workers did (and workers from the bank on the ground floor did not), then during the morning rush, disaster struck. Why the garment workers returned on the morning of the collapse is the essential point of this story. Why the garment workers returned on the morning of the collapse is the essential point of this story. The reason is economic. The minimum wage for a factory worker in Bangladesh is currently £23.91 (roughly $38) a month—a pittance. 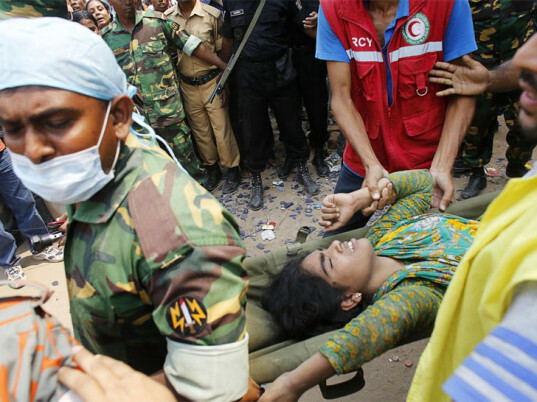 Women and men working in the Rana Plaza clothing factories couldn’t afford to miss a day’s work a risk losing a month’s salary. They were forced to chose between their own safety and being able to feed their families. Even after working huge amounts of overtime paid at a slightly better rate, these women and men live in slum conditions and struggle to feed their families. A living wage—enough to allow a family to live in dignity—is more like £220.20 ($355) a month—more than eight times the minimum wage. This sum demonstrates that the economic freedom which global capitalism preaches is a pie-in-the-sky dream. Living on the breadline also means that the survivors of the Rana Plaza disaster have gone from family breadwinners to family burden overnight. With no jobs and suffering injuries that may prevent them from ever returning to work, they are no longer able to support themselves and their families and many have already been evicted from their homes. 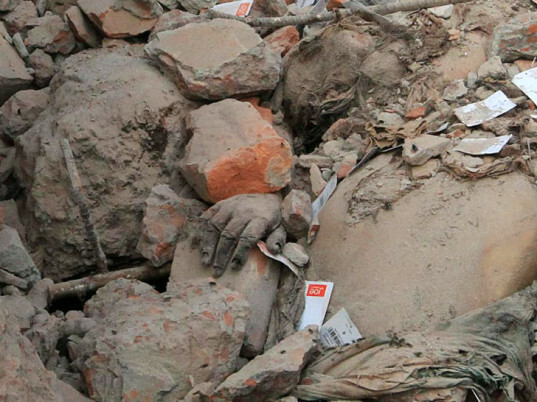 Survivors of the Rana Plaza disaster have gone from family breadwinners to family burden overnight. Economic freedom is at the root of the puzzle of how to fix the garment industry. A workforce that’s able to refuse work that is unsafe, to save and improve their lot, to mobilize and demand better conditions, is a free workforce and one that is an asset to the economies they live in. Instead, global capitalism has the workers of Bangladesh (and Cambodia, India, Sri Lanka, Indonesia…) under the thumb. As global buyers seek ever lower prices, wages and conditions get squeezed. Workers aren’t free; they are economic prisoners kept down by an industry where the money flows ever upwards. The way to fix this isn’t greater top-down auditing, but genuinely empowering the people who work in these factories to be agents of change. That starts with pay. Living wages are the central piece of the solution. An accord on wages? Long overdue. So why is no-one talking about this? Over 100 companies have now signed up to the Accord on Fire and Building Safety in Bangladesh in an effort to make garment factories safe, so such agreements are possible. Yet as soon as campaigners mention wages above the barest minimum or costs per unit going up, deathly silence falls. For too long companies have hidden behind easy corporate-social-responsibility initiatives such as recycled paper bags. Living wages are the central piece of the solution. An accord on wages? Long overdue.